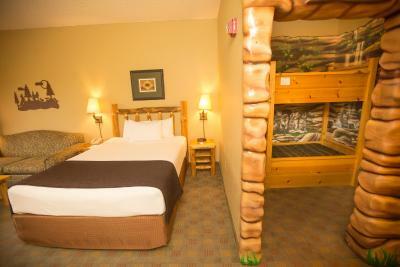 Lock in a great price for Great Wolf Lodge – rated 8.6 by recent guests! 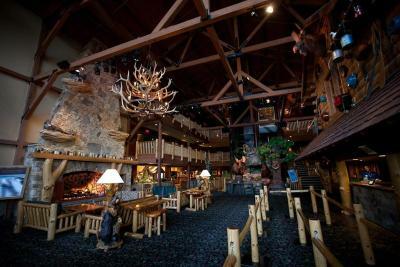 Great Wolf Lodge is a kids dream. The facilities are fun and clean and there is a ton of friendly staff around to help with everything. Lots of slides. Separate Pools for wave pool and activity areas. Lots to do. There are plenty of things to do and my family loved it. 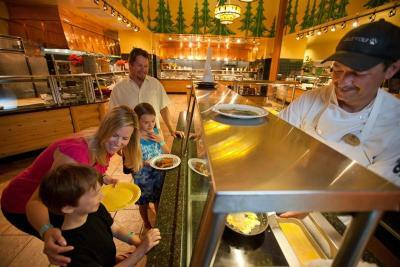 The facilities, rooms and water park are clean and managed well. Having a fridge and microwave helped us to bring drinks and snacks/breakfast items so we saved on food costs. Paw Pass is a great addition I'd highly recommend! The staff was very pleasant and made my daughters feel special. 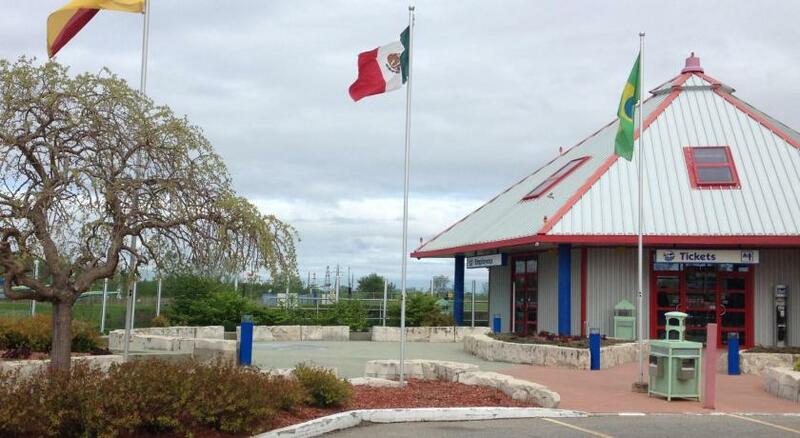 Great location close to the falls and plenty of fun on site for 2 days for a family of 7. Kids had a blast! The kids had a blast I loved watching the dancing at night with the little ones. The room was huge! The water park was clean and up to date! Staff was friendly and helpful! Beautiful facility. First time visit with family of 5. Great room. Clean. 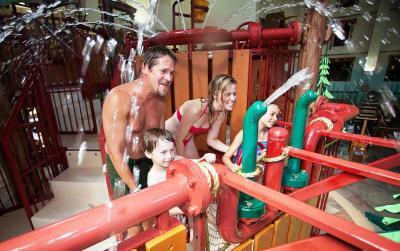 Waterpark has great variety for kids of all ages. Lots of great activities (PawPass was a great deal for us). 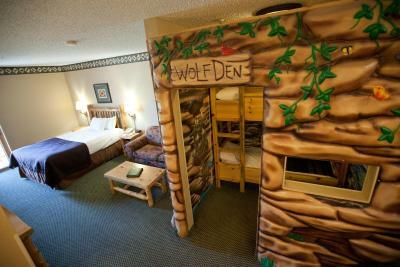 Great Wolf Lodge This rating is a reflection of how the property compares to the industry standard when it comes to price, facilities and services available. It's based on a self-evaluation by the property. Use this rating to help choose your stay! 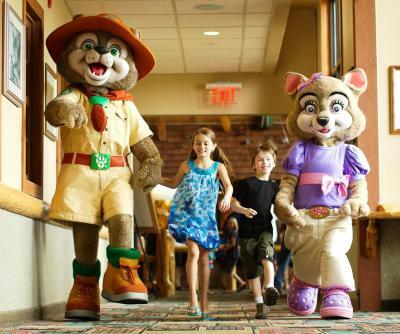 One of our top picks in Niagara Falls.Offering free admission to the on-site indoor and outdoor water parks, Great Wolf Lodge is located 2 mi from Niagara Falls. It features spas, miniature golf and spacious suites with flat-screen cable TVs. Guest suites are equipped with free WiFi, a refrigerator and a microwave. A seating area and a safety deposit box are included. Suites with private balconies are available. 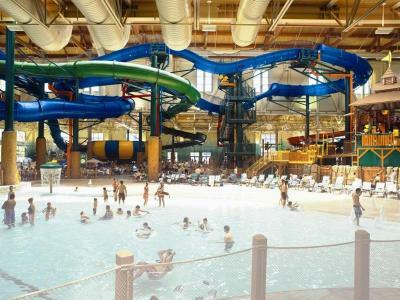 Great Wolf Lodge features 3 hot tubs and indoor and outdoor pools. It has several restaurants, a gym and meeting rooms. Shops and a games room are available to guests. The hotel offers babysitting and has a children’s spa. 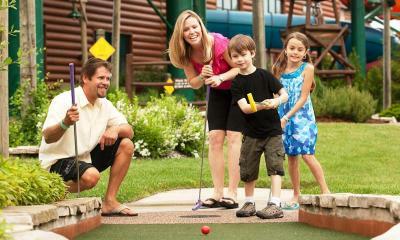 Great Wolf Lodge is less than 1 mi from Niagara Golf Course. 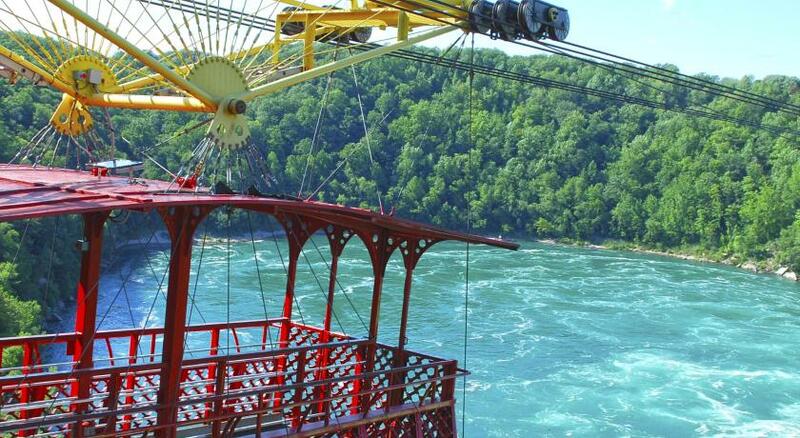 It is within 3.1 mi of the Skylon Tower, Niagara Parks Butterfly Conservatory and Louis Tussaud’s Waxworks. 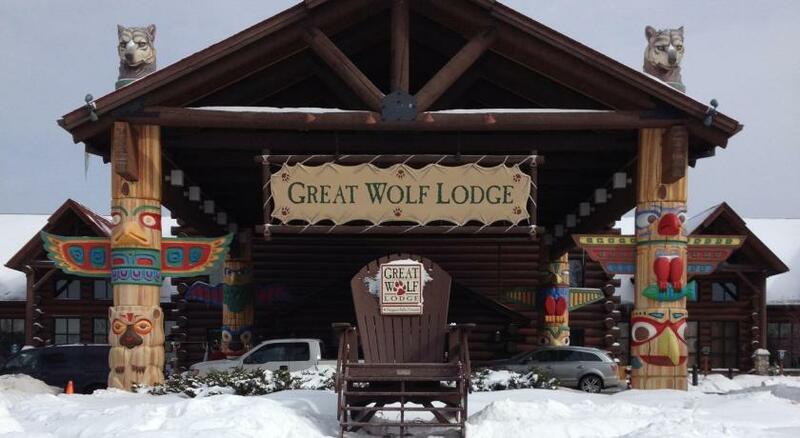 When would you like to stay at Great Wolf Lodge? Featuring 2 queen-size beds and a sofa bed, this spacious suite includes free WiFi and a 37" flat-screen TV. Additional amenities include an in-room safe, microwave, mini fridge and coffee maker. The bathroom is en suite and contains a hair dryer. The suite opens out onto a private balcony or patio, determined at check-in based on availability. The room rate includes free admission to the on-site water parks, which include the day of arrival and the day of departure. The room rate is based on 4 guests. Up to 6 guests can be accommodated for an extra CAD 50 per additional person, per night. 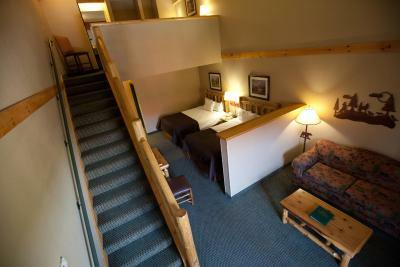 This spacious suite features a king-size bed, an in-room hot tub and a gas fireplace. 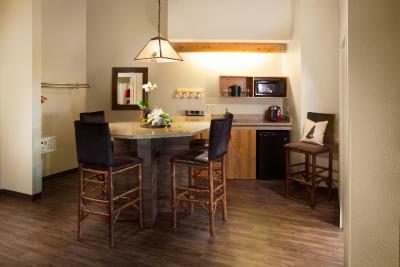 Additional amenities include 2 flat-screen TVs, an in-room safe, microwave, mini fridge and coffee maker. The bathroom is en suite and contains a hair dryer. The room rate is based on 4 guests. This spacious, two-story suite includes 2 queen-size beds and a semi-private living area. 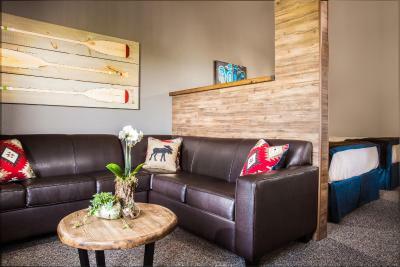 The living area contains a corner gas fireplace, a sofa bed and a 37" flat-screen TV. Additional amenities include an in-room safe, microwave, mini fridge and coffee maker. The bathroom is en suite and contains a hair dryer. The suite opens out onto a private balcony or patio, determined at check-in based on availability. Please note that the room rate includes free admission to the on-site water parks, which include the day of arrival and the day of departure. The room rate is based on 6 guests. Up to 8 guests can be accommodated for an extra CAD 50 per additional person, per night. 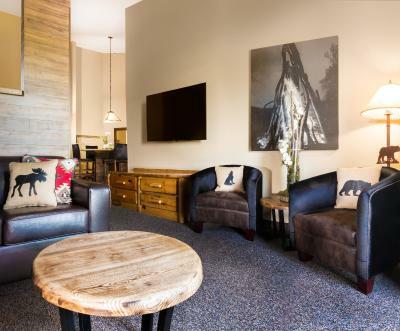 This suite includes a tent-themed sleeping area for children, fitted with bunk beds and a TV. There is also a queen-size bed. Additional amenities include an in-room safe, microwave, mini fridge and coffee maker. The bathroom is en suite and contains a hair dryer. The suite opens out onto a private balcony or patio, determined at check-in based on availability. Featuring 2 queen-size beds and a sofa bed, this spacious suite includes free WiFi and a 37" flat-screen TV. Additional amenities include an in-room safe, fireplace, microwave, mini fridge and coffee maker. The bathroom is en suite and contains a hair dryer. The suite opens out onto a private balcony or patio, determined at check-in based on availability. 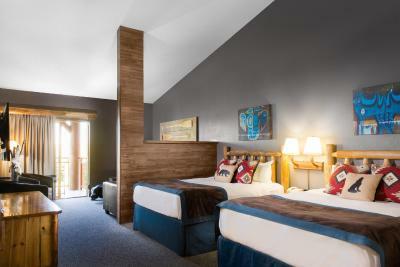 This suite includes a cabin-themed sleeping area with bunk beds and a TV. There is a queen bed and sofa bed in the main area. Amenities include a 37" flat-screen TV, microwave, mini fridge and coffee maker. The bathroom is en suite and contains a hair dryer. The suite opens out onto a private balcony or patio, determined at check-in based on availability. The room rate is based on 6 guests. Up to 7 guests can be accommodated for an extra CAD 50 per additional person, per night. This suite contains a master bedroom with king bed and 37" flat-screen TV. 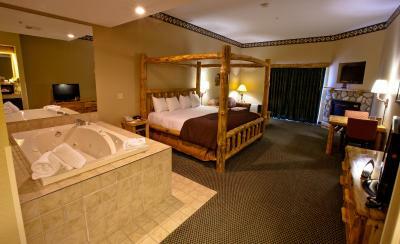 There are 2 queen beds in the main area, along with a sofa bed and additional 37" flat-screen TV. Additional amenities include a microwave, mini fridge and coffee maker. The bathroom is en suite and contains a hair dryer. This luxurious suite features updated fixtures and furnishings, as well as upgraded amenities. The master bedroom contains a king bed and 37" flat-screen TV. There are 2 queen beds in the main area. The living area offers a sofa bed and 55" flat-screen TV. Additional amenities include a microwave, mini fridge and Keurig coffee maker. 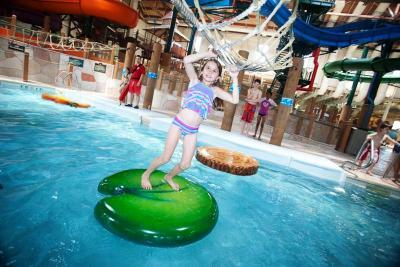 Make plans to spend your family vacation at our indoor water park resort. 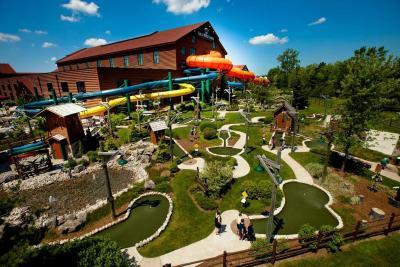 With over 100,000 square feet, there are so many fun things to do in the water park from jaw-dropping thrill slides like the all new Wolf Tail and Niagara Rapids Run water coaster to activity pools and zero-depth-playgrounds including Chipmunk Cove. 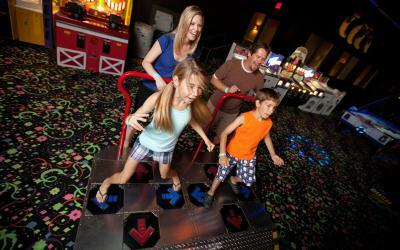 Discover the family fun waiting for you in Niagara Falls, Ontario. 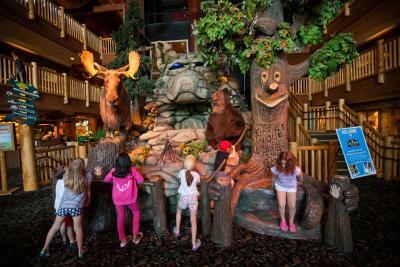 House Rules Great Wolf Lodge takes special requests – add in the next step! 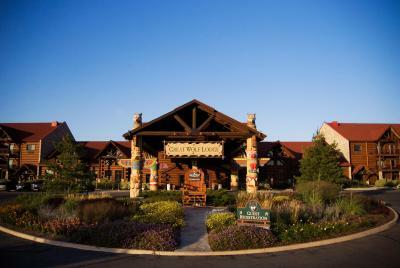 Great Wolf Lodge accepts these cards and reserves the right to temporarily hold an amount prior to arrival. Upon arrival, guests can have access to the water park from 13:00. Please be advised that a deposit will be charged after your booking is made in order to secure your room. For all guests checking out on Sunday, September 10th, 2017: The water park and Lodge will be closing at 4pm on that day. For all guests checking in on Friday, September 15th, 2017: The water park and Lodge will be opening at 4pm on that day. The food on the resort was very expensive and not good at all. Even the kids weren’t crazy about the pizza. There is definitely room for improvement here. We ate off resort for every meal but our first because of the quality. The theme, some of the staff are helpful and accommodating. No adjoining doors between rooms. No turndown service... so nap time beds stayed sloppy.. Did not replenish coffee etc in am. Poor lighting. Expensive meals. Lazy river water was way too cold. Not enough staff on slides so lines were longer than they should have been. Spending $500+ CAD for a one night vacation seems excessive. Game room was way over-priced. Washroom in the room was tiny. The duvets in the rooms could be thicker- it felt like nothing was on the bed. The food and beverages were expensive. I wish PJ time was cheaper as well... With 3 kids, staying there is already very expensive. Debra at the omelette station was awesome! And Brent the RMT was really great at his job. Those 2 employees were stand out for me. Thank you! The high ceilings in the room were nice. Lifeguards seemed very attentive which provided a sense of security, helped me relax. Other than that I was quite impressed with the cleanliness of the waterpark. 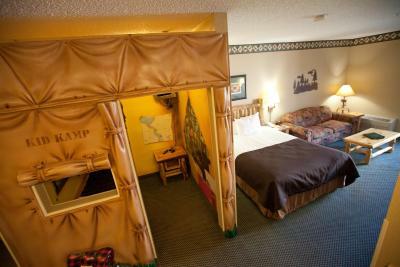 Kid Kamp suite was described as having a Queen bed. The bed was definitely smaller. Food choices in the water park are limited and the food was mediocre. it is expensive, from the buffet to the room rates. A lot of money for one night away. Love GWL our family had an amazing time. Perfect for small children and preteens. Love the dance party and we came on their anniversary so we got to watch the fire works. I think it's time to do some upgrading and refurbishing. We noticed some peeling paint, the waterpark is beginning to look a little tired and the water is COLD. The kids loved the water park but it would be great if there were more "safe zones for walking" where you'd be guaranteed of not getting sprayed by someone above you. I.e, if you were carrying a baby who wants a bucket load of water dumped on your head? Or if you're walking with a tray of food... Not a lot of safe zones that way. But overall the kids had a blast. They hired to many young staffs that’s are rude and don’t know how to deal with customer. The dinner buffet was really good.